Here are 3 more short Easter poems and verses - written around the theme of Spring flowers - along with 4 photos. 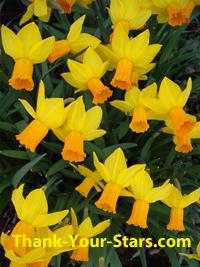 Closeup of 4 daffodils in full bloom. I took this photo on Monday, April 25, 2011, the day after Easter. The flowers on this page are some of the earliest to bloom in the spring. In fact, where I live, they often get snowed on when in full bloom! While they were blooming, the flowers seen on this page were buried under 4 inches of snow on the Thursday before Easter, and 8 more inches the Tuesday after Easter, even though Easter Sunday was in the last week of April. 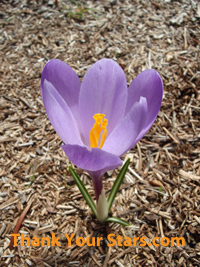 These flowers grow because of the cold spring rains - they grow even in the snow! It's nice that Easter always comes in Spring - unless you're in the 10 percent of the world's population living in the Southern Hemisphere. "Do your duty, steady, surely." Betrayed for just a pittance. It is for us salvation time. The wicked say good riddance. New summer in all it's glory. 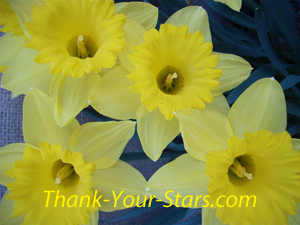 Why Easter Poems and Verses About Flowers? On Easter Sunday, our churches and homes are filled with flowers, especially lilies. Do you know why? 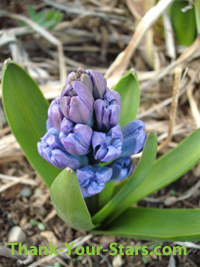 Do you like to see the first flowers in Spring? Especially after a long cold winter. You can hardly wait, it seems forever. It's like, F-I-N-A-L-L-Y !!! The grass is growing, the early flowers start to bloom. The world waited 4000 years for the Messiah. Then 30 years until his public life. Then 3 years until his death. Then 3 days until his Resurrection from the dead. Then he burst forth from the tomb, like flowers that bloom! Flowers help us rejoice! They look and smell so nice. Alleluia! to the gentle King. Before I get into this next poem about daffodils, I just want to say something about this last poem. I used the last verse in another poem that I wrote for this page for Easter, called "Rain Flowers". It seemed like an appropriate comforting poem in the sympathy section of this website, since the Resurrection of Jesus gives hope to us in our sorrow and pain. Remember, when Jesus rose, he had been through terrible suffering, pain and death just a few days before, and many of his followers were still in shock and disbelief. They had held a hasty funeral procession on Good Friday evening, and the holy women were still in the process of burying him with the appropriate spices, when Jesus arose. I think it's worth including in these short Easter poems and verses, that's why I'm giving the link to this comforting poem from this page. Smile with colors God's hand places. Then as a man, fought evil's power. He gave his life, as truest friend. Heaven is open, for you and me. I wrote some of these Easter poems and verses on April 19th, 2011, the Tuesday before Easter. What's special about this day, it's the first anniversary of this website. Finally, it seems this website is going to bloom - after an extra long, hard winter, involving years of no income, a lot of expense, a lot of work and training, and many challenges and difficulties. I hope one day soon to see the fruits.